It's here and it's only getting bigger! Neither trade wars nor saber rattling in the South China Sea nor global warming nor cyberterrorism can blunt the forward progress of this Asian juggernaut. The data is clear: It’s here and it’s only getting bigger! So what do recent data sets from the brainiacs at Morgan Stanley have in common with the data visualization bubbles of the late (1948-2017) Swedish physician-epidemiologist and statistician Hans Rosling? For one thing, both see the phantasmagoric—but very real—enormity of the economic tsunami that’s rising up all over Asia. Specifically, it’s a Chinese tsunami, but don’t forget Southeast Asia, and definitely don’t forget about India; and not because India just pulled off a first-ever by flying 104 satellites into orbit using a single rocket, but rather, because its entire space budget is slightly over $ 1 billion. For another thing, both Morgan Stanley and Rosling see eye to eye on the continuity of the economic convergence taking place on a nearly identical timeline. And for yet another, both ascribe what’s taking place to the very same cause: spending! Spending by common people uplifted from poverty with extra money to put towards bettering their welfare and that of their families. 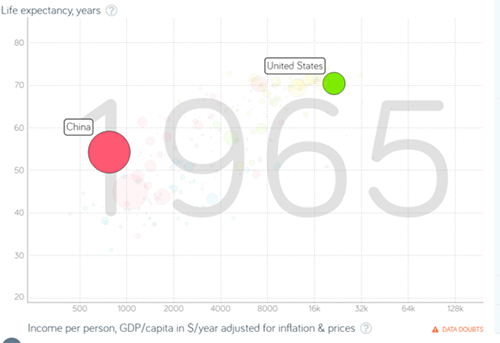 Rosling’s now-famous data visualization bubbles, from what he titled Asia’s Rise—When & How, are vintage 2009, bubbling up during the chaotic onset of the Great Recession when the world stopped thinking about any economic future. Morgan Stanley’s Why We Are Bullish on China is a research product from a team of twenty-four researchers from a multinational financial services company with over $1 trillion under management. 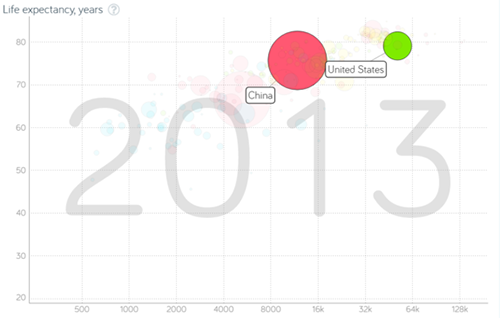 On the social spectrum side of things, Rosling and Morgan Stanley couldn’t be further apart. Their data sets, however, make them kindred spirits that take precisely the same road but separated by eight years of Rosling’s data bubbles. 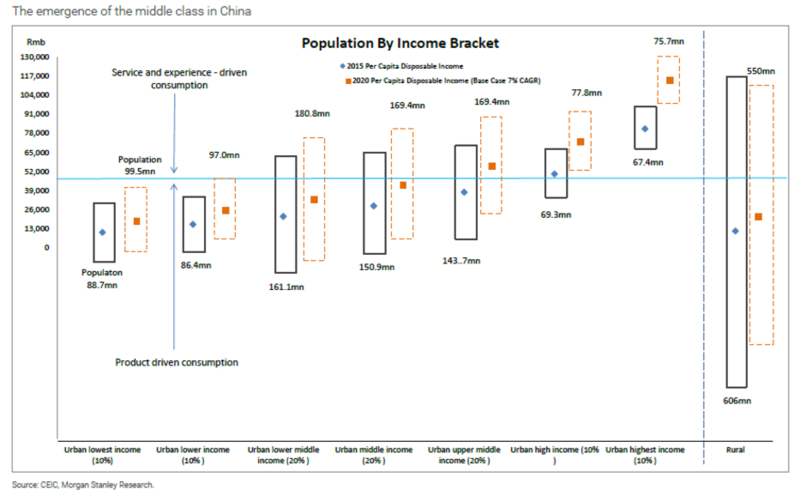 The Morgan Stanley 118-page report coalesces around the year 2027, and opens with this table-setting sentence: “China’s shift from low income to middle income status has been the largest and most rapid economic transition in world economic history.” Wow! Rosling’s visual opus shows two-hundred years of Asian history—in the form of rising bubbles angling upwards across a screen—accompanied by two minutes of narration from Rosling. As China’s red bubble floats up to 2013, it’s in close proximity to and has parity with the U.S. in per capita GDP and longevity. The astounding moment in the bubbles’ journey is when China overtakes the U.S. in 2048, returning it to a state of global prominence it hadn’t seen in a hundred and fifty years. Curiously, that’s one year preceding the 100th anniversary of the People’s Republic of China. Morgan Stanley’s report masterfully deconstructs the next decade of that bubbly journey to 2048, namely: 2017-2027. What does it all mean for robots and automation? With China claiming that it will beef up its stock of industrial robots from 36 per 10,000 workers to 100 per 10,000 by 2025, it is easy see why International Data Corporation (IDC) has identified robotics as one of six Innovation Accelerators that will drive digital transformation to massive sales revenues. In its Worldwide Commercial Robotics Spending Guide, IDC’s research director, Dr. Jing Bing Zhang, forecasts total global spending on robotics, including robotic systems, system hardware, software, robotics-related services, and after-market robotics growing at a CAGR of 17 percent “to $135.4 billion in 2019.” A full eight years ahead of Morgan Stanley’s magical 2027. If we lump together industrial robotics with personal assistant robots, delivery vehicles, surgical assistants, exoskeletons, logistics robotics, UAVs and drones, among many others, Tractica piles on another $90 billion to the total for an astounding $226 billion by 2021. A mere five years off. Japan has an interesting and smart plan for a future where its market share of selling robots to China gets drastically slashed. China’s new but indigenous robot industry builds 16 percent of the country’s robots; plans are in place to increase that to 50 percent by 2025. That means billions of dollars in lost revenue for Japan, maker of 60 percent of the world’s robots. The solution for Japan is to rustle up a new mega-customer that is a manufacturing colossus yet has no indigenous robot industry of its own. Where could that be? How about the United States? Prime Minister Shinzo Abe’s recent trip to Washington lays out a brilliant plan to finance America’s crumbling infrastructure, much of which was built during the Eisenhower Administration. The American Society of Civil Engineers puts the total reclamation tab at $3.6 trillion. In the process of spending on infrastructure, Japan’s robot industry stands to make considerable gains. Abe’s plan is simple: Japan’s massive Government Pension Investment Fund “will purchase debt issued by American corporations to finance infrastructure projects.” Up to 5 percent of the GPIF fund, roughly $50 billion, is allowed to be used on overseas infrastructure projects. It surely doesn’t touch the needed trillions of dollars, but hey, got to start somewhere. America, what a great new place to sell robots for infrastructure reclamation. Plus, high-speed rail projects in Texas and California; joint development of medical and nursing care robots; and now that Fukushima is getting worse, joint research in decommissioning nuclear reactors. All in all for Asia, 2017-2027 may well come to be known as Asia’s Golden Age of robots. China’s stats are off the charts! Private consumption in China will double in size over the next decade, rising from 2016’s $4.4 trillion to an estimated $9.7 trillion. Yes, that’s “t” as in trillion! Morgan Stanley estimates that the services sector will be 60 percent of GDP (in 2016 it was 52 percent), rising to $12 trillion. All of that from a country of 1.5 billion that is technically still “emerging”. Officially, China is still emerging, the critical difference being that it mega-spends. These days, it’s the government that spends, as in between 2011 and 2013 when China bought 6.4 gigatons of cement (1 gigaton is roughly 1 billion metric tons), enough cement to cover every square inch of Hawaii. All of that government spending (10 percent GDP growth for ten straight years) also benefited China’s neighbors in both East and Southeast Asia. To the chagrin of many of those neighbors, it’s overseas spending that is now retracting. Now however, all that mega-spending will be coming in the form of consumer consumption, from a consumer base with per capita incomes of $12,900, who will spend $9.7 trillion on food, electronics, white goods, travel, entertainment, and automobiles. If the future’s enormous demands from consumer consumption are to be met, manufacturing, logistics and transportation will need to totally automate: smart factories and smart warehouses, more roads and superhighways, more energy, much, much more of everything. The churn from e-commerce alone from 500 million demanding customers is both exciting and sobering to think about. Most of all, China will need robots—by the hundreds of thousands; millions, even!—of every sort in order to pull off supply and demand. Is that enough to propel the decade from 2017 to 2027 into the status of Asia’s Golden Age of robots? Most definitely. That’s only the beginning, there will still be another two decades more to go before linking up with Rosling’s great moment in 2048.